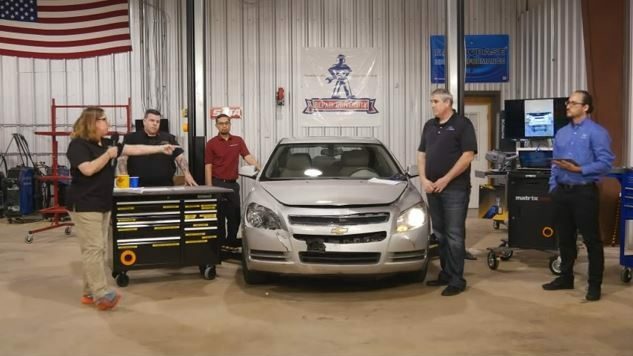 Consulting the OEM repair procedures and measuring the vehicle prior to a repair revealed a seemingly minor pole strike — no airbags deployed — on a 2012 Chevrolet Malibu LT to result in a total loss. 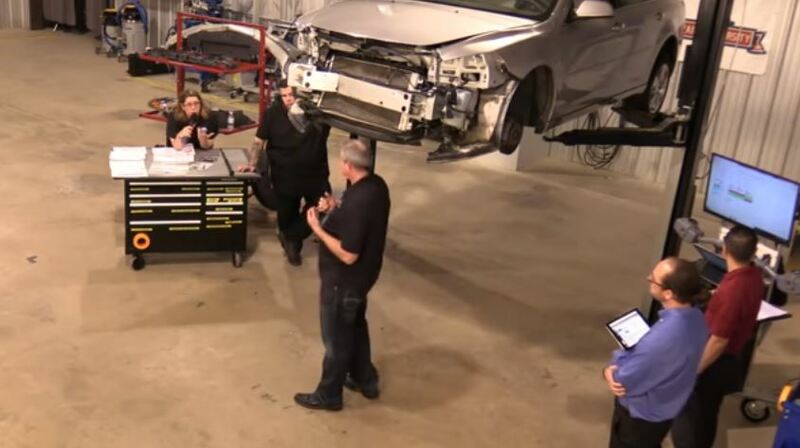 That assessment in a spring Collision Hub “Repair University Live” episode demonstrated both the need for proper blueprinting and the kind of vehicle and OEM repair information that can be revealed by it. “We have totaled this poor Malibu,” Collision Hub CEO Kristen Felder said on the April show. 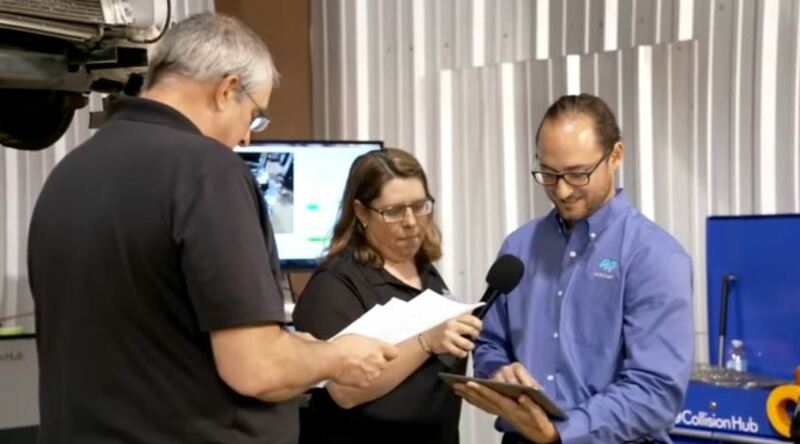 The show’s estimate was generated by Mitchell product manager Frankie Costa using the information revealed in General Motors OEM repair procedures and a Matrix Wand pre-measuring of the sedan. The show did not disclose the dollar amount generated by the truncated blueprinting demonstration. However, Felder midway through the show noted the estimate had reached $5,100 — and this was prior to Vehicle Collision Experts CEO Mark Olson’s description of the extensive steps necessary to replace damaged front frame rails. Kelley Blue Book reported a 2012 Chevrolet Malibu in Collision Hub’s 72019 ZIP Code would sell for about $7,598 from a private party and about $9,350 from a dealer. Based on the show, those repairers who dispute that the Malibu is a total are either not billing for a lot of the work they do — or worse, not following the necessary OEM procedures at all. Felder noted that a shop could make a decision about which line items it billed the customer. (The vehicle owner, not the insurer, is the customer, the show stressed.) But “you cannot make a business decision for choosing not to do something,” she said. 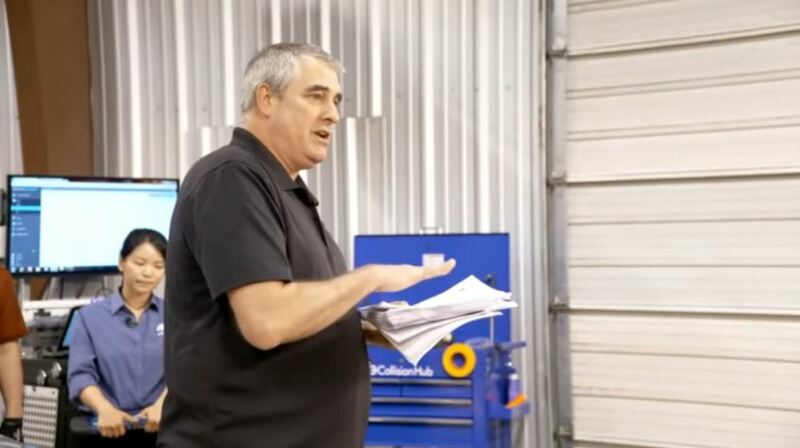 Otherwise, the shop would accept tremendous liability for deviating from OEM repair procedures, according to the show — whose three hosts all appear as expert witnesses in collision cases. If General Motors says to perform a particular procedure, and the shop says in court they didn’t do it, “Where you gonna go with that?” Olson said. The process described by the show involved at least two employees working in tandem: an estimator and blueprint technician. “These should be the two most in-sync people in your shop,” Felder said. She said the estimator should be present during the disassembly and blueprinting discussion. She said it was frustrating as an insurance adjuster when an estimator had a list of line items but not have any idea why those items were necessary. Montanez said the damage assessor didn’t have to physically perform the repair, but they had to understand it and be able to explain it in layman’s terms. The first step is to interview the customer about the collision and perform research, according to Felder. Finding out circumstances of the crash, such as whether the vehicle slid or rose onto a curb can be useful information when hunting for damage, she said. In this case, the driver was a 200-pound male, and the passenger was a 120-pound female, Olson said. Two rear seats were occupied, one by a child in a child seat, one in a child sitting on the vehicle seat. The airbags did not deploy. The next step is to perform research, said Olson, showing a massive sheath of documents. One might say, “‘That’s a large book,'” he said, noting it was full of separate repair operations. The scan revealed a variety of codes, Mitchell product manager Geeng Yee Chong said. Olson described GM procedures as calling for a lengthy pre-inspection process of seatbelts, the instrument panel, knee bolster, mounting area and steering column, which might involve some disassembly, according to Montanez and Olson. “This is not included,” Olson said. The tech would then proceed with disassembly, noting anything broken and non-reusable for the estimator, according to Felder. Parts should be labeled and set aside, and items of interest also shown to the estimator. Repairers should also premeasure the car, according to Montanez. “Every single car. … it’s your liability protection,” he said. There’s also a chance “you might have a rerepair issue” from a prior shop’s incorrect repair, he said. Your shop faces the liability for being the last shop to touch the car, according to Olson and Montanez. With modern vehicle design, a vehicle that visually seems fine might actually be compromised. Felder and Montanez recalled a shop which swore that the vehicle’s structure was fine, Honda had just sent three bad doors in a row. A simple Matrix Wand measurement proved the shop’s eyeball analysis wrong. Another Collision Hub investigation asked shops how many cars in their lot “‘do you swear have no damage whatsoever? '” Felder said. A check with the Matrix Wand found about 4 out of 10 actually had structural damage, “sometimes significant,” with 18-20 mm of travel damage, according to Felder. In this case, the Matrix Wand found measurements off by 4 mm on the passenger side and 9 mm on the driver side, Matrix Wand ‎director of support and technical training Sergio Correa said. Additional teardown would be necessary to see if the shop would be performing a setup, measure and pull or setup, measure and cut operation, Felder said. And since there’s documentation, “I would charge premeasure on this,” Felder said. “What do we want to know about this car? … We want to know everything,” Olson said. And you want to know immediately, before the actual repairs or the car is on the frame bench, according to him and Montanez. Pre-measuring and OEM documentation allow the shop to do so, Olson said. The rear of the vehicle also needed to be checked on a low-speed collision, for the rear control arms might be affected. Failure to check might leave the shop realizing it needed two more parts during the alignment, Montanez said. The Matrix Wand also can work underneath a vehicle on a two-post rack, Correa demonstrated. He said the cradle was square but had shifted from the rail’s movements, and the control arms were misaligned, in one place by 6 mm. The vehicle needed a wheel alignment and cradle readjustment, he said. The passenger seat probably needed its occupant sensor recalibrated, Montanez said, and Costa noted that the replacement of headlights called for an aiming procedure there. Olson said that the body repair manual didn’t say anything about the front frame rail (technically the crush initiator for the frame rail, he noted) — a shop had to look it up in the front fender section of the paid GM site. The question was whether the repairer could fix it to the same shape and state. Steps for replacing those front rails include loosening and protecting the fuel and brake lines, Olson said, and Montanez said the latter would require a pressure-bleeding and potentially an ABS bleed if the vehicle. The shop is then instructed to support the engine and transmission with “suitable equipment,” remove engine and transmission fasteners, and remove all related components and panels as necessary — “everything attached to that rail” as necessary, including the suspension and crossmember, according to Olson. Many shops would have clicked “replace rail” without noting all the not-included operations and griped that it only paid 1.0 hours, Felder joked. Other steps would involve disabling the supplemental restraint system and battery, according to Olson. Montanez also pointed out that the rail would have to be painted. “All this other stuff” is not in the free body repair manual, Olson said. Steps in the repair might trigger the need to research still other OEM repair procedures besides those on the page immediately before the estimator. For example, the act of disconnecting the battery triggers another set of diagnostic procedures, and a GM instruction to apply an approved weld-through coating or equivalent to mating surfaces means the estimator needs to research what coating was approved, according to Olson. “We’re just building book, after book, after book, after book,” he said. After concluding from measuring that no damage exists beyond a certain point, the estimator would pull up the sectioning instructions. Because welding has been done, GM states that proper corrosion protection needs to be applied, according to Olson. These items (for example, cavity wax) might be included, or they might not be — the estimator probably needs to check their P-pages, he said. There’s also an outer rail to check, which demands other parts be R&I’d to access. Wire harness removal often aren’t in estimating system labor time databases, which means the estimator would have to ask a technician how long the work takes, according to Montanez. The harnesses themselves need to be protected, Olson said. 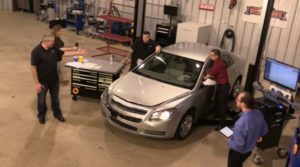 The Malibu was at this point totaled, according to Felder, who noted that other training such as a four-hour I-CAR blueprinting course could go even more in depth. Asked for examples of other items the show hadn’t even addressed yet, Montanez mentioned the tires. Do they need to be reinstalled to get the vehicle back onto the frame machine? Does the repairer have to remove the spare tire and use it? Training will teach a shop all kinds of “stupid little things” which need to be done during a repair, he said. Adopting proper blueprinting is about “change,” Montanez said. Shops do get faster at blueprinting with practice, he said. A repairer can certainly do any of these steps for free, but “‘I can’t not do things,'” said Felder, who encouraged shops to put all the items on the estimate (even if they were performed for free) as documentation should the repairer be sued.